President Zuma met with his Senegalese counterpart, President Macky Sall, to strengthen bilateral relations between South Africa and Senegal and exchange views on critical regional and global issues. 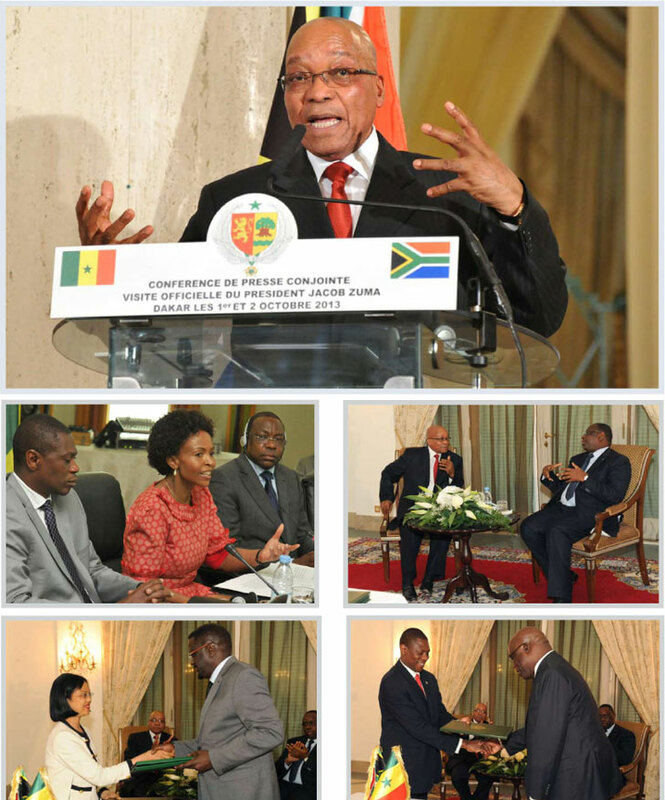 President Jacob Zuma undertook a State Visit to the Republic of Senegal from 1 to 2 October 2013. The visit afforded President Zuma and his delegation an opportunity to engage with the Senegalese Government on specific areas of interest between the two countries. 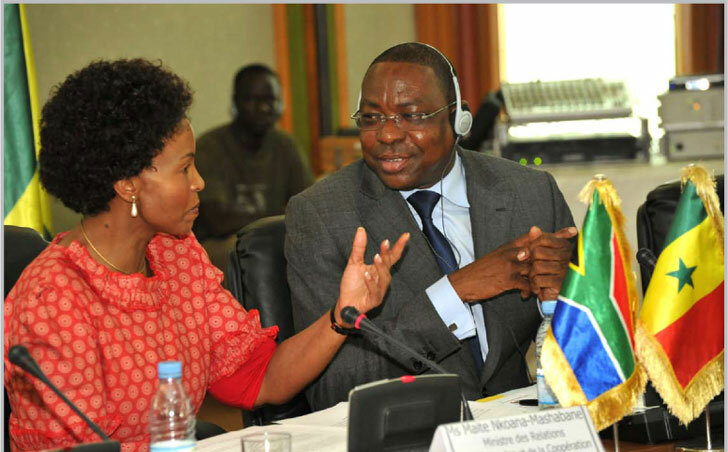 Bilateral relations between South Africa and Senegal received a new impetus after the election of His Excellency, Macky Sall, as the President of Senegal in 2012. South Africa and Senegal have healthy economic relations and there is still room for a lot of improvement in trade relations. In 2012, South Africa exported a total of about R830 million in goods to Senegal, whereas the Senegalese exports to South Africa totalled about R12 million. The two Presidents accompanied by Ministers held successful talks and agreed to strengthen cooperation in areas such as agriculture, mining, trade, tourism, higher education, training, scientific and technical research, and energy. The Presidential delegation also included South African business persons, who attended the South Africa-Senegal Business Forum on 3 October 2013 in Dakar, with a view to promote and expand trade and investment between South Africa and Senegal. The Ministerial JCBC is aimed at strengthening bilateral relations and further cooperation in the field of security (defence capacity-building); arts and culture; trade and economic development; energy; environment; mining and mineral beneficiation; agriculture; water purification; and employment (job creation). The Minister of International Relations and Cooperation, Maite Nkoana-Mashabane, co-chaired the Second Session of the JCBC with her Senegalese counterpart, Mankeur Ndiaye, Minister of Foreign Affairs and Senegalese Abroad, on 30 September in Dakar. The Ministers used the JCBC to discuss multilateral and regional issues of mutual interest. South Africa and Senegal enjoy warm relations, which were established with the inauguration in Pretoria of the JCBC in 2008. The JCBC meeting has resulted in bilateral agreements and memoranda of understanding (MoUs) in the following areas: the promotion of investments, and cooperation in the fields of civil aviation, health, technology and defence. The signing of the Agreement on Cooperation in the Field of Arts and Culture and the MoU on Cooperation in the Field of Agriculture during the recent State Visit will further strengthen the ties of friendship between the two countries. 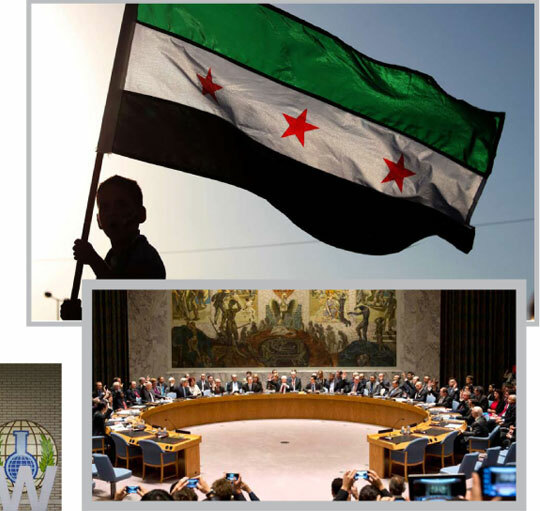 The South African Government encourages all parties involved in the current conflict in Syria to, without delay, engage in a process of all-inclusive national dialogue, free of any form of violence, intimidation or outside interference aimed at regime change, in order to satisfy the legitimate democratic aspirations of the Syrian people. South Africa has welcomed the decision of the Executive Council of the Organisation for the Prohibition of Chemical Weapons (OPCW) in The Hague, providing for the destruction of chemical weapons in the Syrian Arab Republic and its subsequent endorsement by the United Nations Security Council. Throughout the negotiations, South Africa sought to ensure that the decision complied with the provisions of the Chemical Weapons Convention and upheld the principles of multilateralism. South Africa maintains that the OPCW has the mandated responsibility to supervise the destruction of chemical weapons in Syria and is pleased by Syria’s accession to the Chemical Weapons Convention and its compliance with the first step of its obligations under the convention. “We urge Syria to fully cooperate with the OPCW and to speedily and fully implement its obligations under the convention. 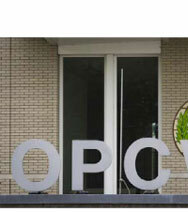 The OPCW’s decision is part of diplomatic efforts to find a durable solution to the use of chemical weapons in Syria,” the Department of International Relations and Cooperation said in a statement on 28 September 2013. South Africa deplores and condemns the use of chemical weapons in Syria in the strongest possible terms. There is no cause that could justify the use of weapons of mass destruction, by anyone or anybody under any circumstances. 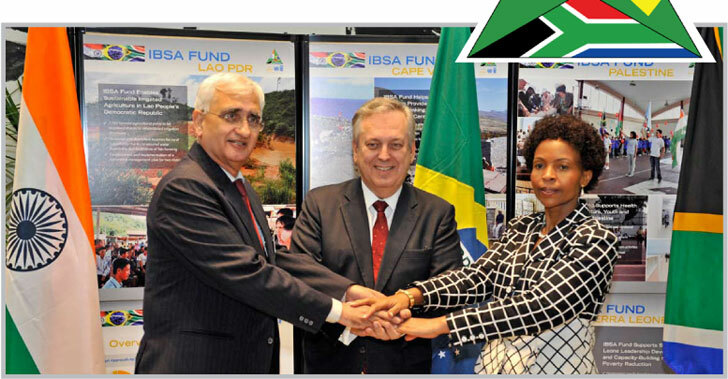 2013 marks the 10th anniversary of the formal launch of the India, Brazil, South Africa or IBSA trilateral initiative. The Minister of External Affairs of the Republic of India, Salman Khurshid, the Minister of External Relations of the Federative Republic of Brazil, Ambassador Luiz Alberto Figueiredo Machado, and the Minister of International Relations and Cooperation of the Republic of South Africa, Maite Nkoana-Mashabane, met in New York on 25 September 2013, on the margins of 68th Session of the United Nations General Assembly. The Ministers exchanged views on the contemporary global and regional issues of mutual interest as well as reviewed progress made by IBSA cooperation since its formalisation through the Brasilia Declaration of June 2003. The Ministers noted with satisfaction the progress on the consolidation of the IBSA Dialogue Forum. They underscored that IBSA had succeeded in laying a strong foundation for multidimensional and multisectoral cooperation in a wide range of areas. Political dialogue among the three countries has positively contributed to the global discourse on issues of common interest. The Ministers reaffirmed their commitment for further strengthening the trilateral cooperation and recognised the renewed relevance of IBSA. The Africa-India Ministers of Trade annual meeting aims to enhance trade relations between Africa and India on the basis of mutually agreed priority areas, as well as to review the progress of the partnership in terms of commitments undertaken and implemented. The Africa-India Ministers of Trade meeting was hosted by the Department of Trade and Industry in Johannesburg on 1 October 2013. 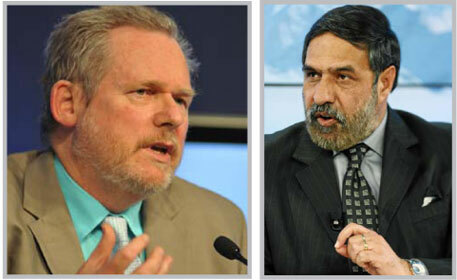 The event was addressed by the Minister of Trade and Industry, Rob Davies, the Minister of Commerce and Industry from India, Anand Sharma, the Chairperson of the African Union, Nkosazana Dlamini Zuma, as well as the co-chairs of the Africa-India Business Council. January, according to the latest survey by the Reputation Institute. According to the latest RepTrak Report, South Africa’s reputation dropped in January, from 47,56 to 46,78 points out of 100, but increased to 51,24 in September. “The new analysis in this year’s report shows progress in broadband availability, but we must not lose sight of those who are being left behind,” United Nations (UN) Broadband Commission co-vice chair Hamadoun Toure. Forty-one per cent of South Africans use the Internet, placing the country fifth in Africa and 92nd worldwide for individual Internet usage, and above the world average of 35,7%, according to the 2013 State of Broadband Report released by the UN Broadband Commission. The report finds that just over a quarter (25,5%) of South African households have Internet access, placing the country fifth in Africa and 44th among developing countries for household Internet access, and just above the 24% average for the 128 developing countries measured in the report. When it comes to fixed broadband penetration, the report ranks South Africa 111th worldwide, with 2,2 out of every 100 people enjoying fixed broadband subscriptions – well below the global average of 9,1. However, for mobile broadband – which allows people to access the web via smartphones, tablets and Wi-Fi-connected laptops – South Africa ranks 62nd worldwide, with a connection rate of 26 out of every 100 people compared to the global average of 22. 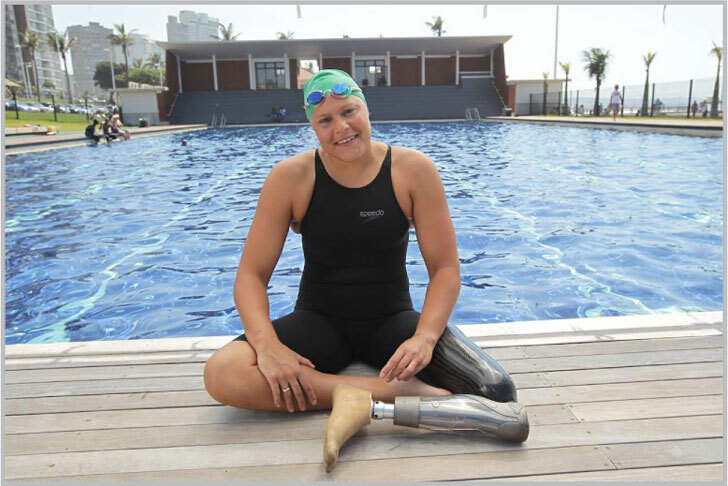 South African swimmer Natalie du Toit, who led the way in bridging the divide between Paralympic and Olympic sport, was to receive an honourary MBE (Member of the Most Excellent Order of the British Empire), the British High Commission announced recently.